The team raced the womens version of the GP de Cholet in France. Oceania Champ Lauren Kitchen crashed in the middle of the race but was brought back in the peloton by season debutant Thea Thorsen and Julie Leth. After active racing we managed to form a break of 18 girls with Tatiana and Miriam, which later was reduced to only 12 girls. In the final kilometers, Miriam attacked together with Cordon (Wiggle Honda) and Rivat (Futuroscope) and in the sprint Cordon was the strongest. Miriam’s 3d place is her first UCI-podium and her best international result so far. Tatiana Guderzo finished 11th. The full results can be seen here. The Ronde van Drenthe weekend consist of 3 UCI-races, first one the 12.March, second one 14.March and the 3d on 15.March. For the first time we could muster the formidable Dutch sprinter Kirsten Wild. The first race, Drentse8 Van Dwingeloo saw young Emilie Moberg getting into the descisive break and sprinting to a 4th place, behind 2 time world champion Giorgia Bronzini (Wiggle). This Video show the finish, which saw a spectator bringing down Loren Rowney (Velocio SRAM). This spectator was taken care of by the police. For Moberg, this was her best result so far this season. On the Saturday World Cup race, the team suffered a string of small setbacks when 4 of the 6 riders punctured. Worst was when Kirsten Wild punctured out of the lead group late in the race. Even if the team worked hard and got her back to the leaders just before the final, Kirsten could only manage a 11th place. 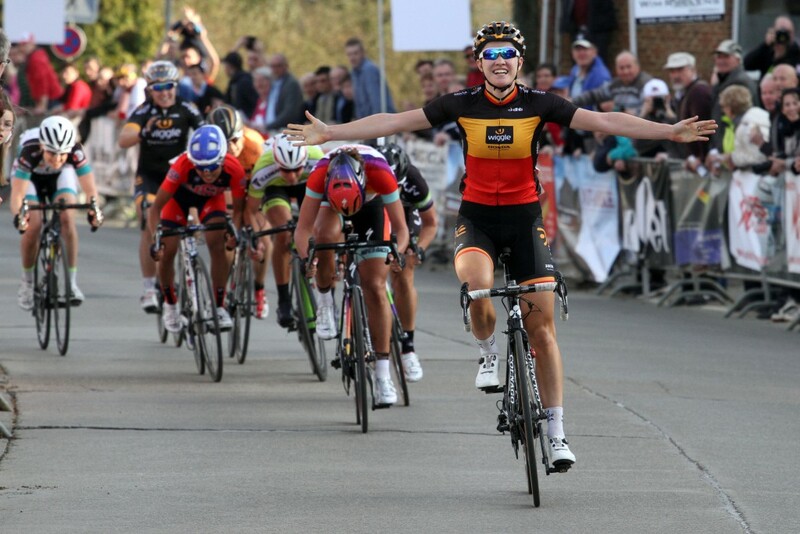 Jolien Dhoore (Wiggle) won. For the sundays race, Novilon Ronde van Drenthe, everything was allright again. Kirsten Wild won her first race for 2015 in typical style, when she beat ex-Hitec rider Chloe Hosking (Wiggle) in the bunch sprint. Sunday the team did their 3d race in Belgium for a week. Tatiana and Lauren broke away with 9 other riders and finished 7 and 10, winner of the day was Belgian Champion Jolien Dhoore. Emilie ended on 19th place. This years issue was won by Chantal Blaak (Boels Dolmans). Tatiana was our best at 14th place.